One funky infographic that'll keep you on track with Facebook, Twitter and Instagram. As a hotelier, you probably have 6428 things on your mind. We've compiled a cool looking social media checklist, which hopefully means you have one less thing to worry about. Print it off and analyse it over breakfast. Carry it in your handbag for some light reading on the bus. Sleep with it under your pillow to absorb valuable information. Turn it into an award-winning paper aeroplane. Use it as wrapping paper. Expect it to run your social media for you. We hope you find this checklist useful. It is by no means the be all and end all. But at least now you should only have 6427 things on your mind. Want some more inspiration? 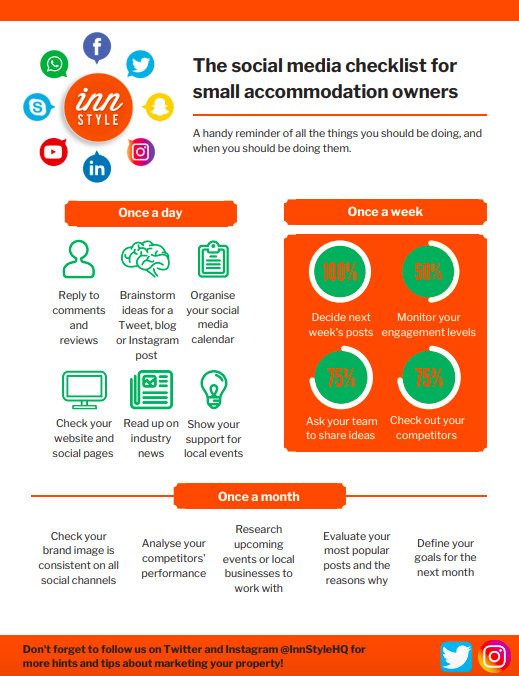 Check out our top tips for marketing your hotel or B&B on social media. Don't forget to follow us on Twitter and Instagram (@InnStyleHQ) too!